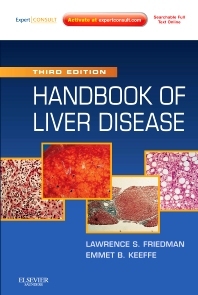 The Handbook of Liver Disease, 3rd Edition, by Drs. Lawrence S. Friedman and Emmet B. Keeffe, gives you quick reference to the most recent diagnostic and treatment options for patients with liver disorders. International authorities share the latest clinical findings and procedures to help you expertly manage illnesses like hepatitis B and C and hepatocellular carcinoma, as well as apply new practices like genetic testing, noninvasive imaging techniques, and so much more. Quickly access updated information on all aspects of liver disease including new drugs, therapy trials, and post-transplant conditions with this full-color, templated edition–in print and online at www.expertconsult.com.